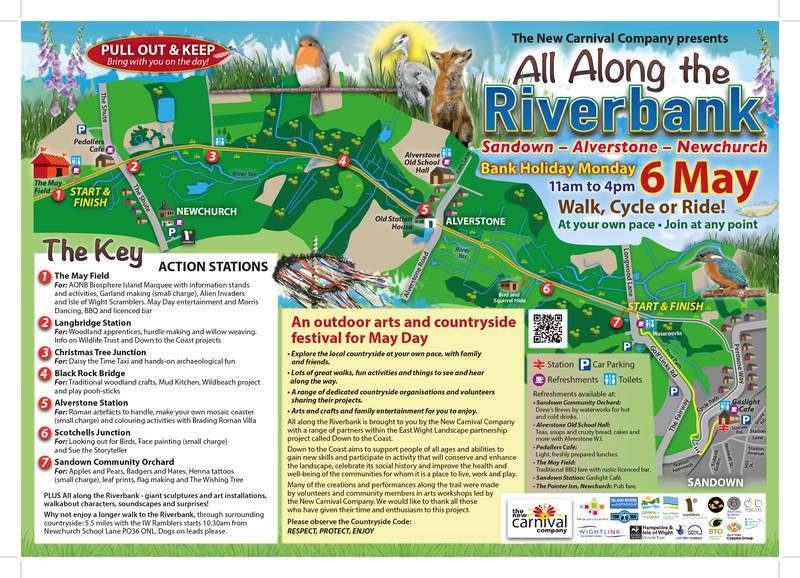 All Along the Riverbank, now in its third year, is an outdoor arts and countryside festival especially for May Day. It takes place on May Day Bank Holiday Monday 6 May 2019 from 11am to 4pm. The event site boasts an unusual footprint, being 2 miles long and just a few metres wide, as it follows the Island’s River Yar on the eastern leg of its journey from source to sea. The riverbank is especially accessible as runs alongside the NR 23 cycle way (The Squirrel Trail) between Newchurch (Langbridge) and Sandown Waterworks, once part of the Island’s Rail network. It is home to an abundance of diverse plants and wildlife, social history, rich archaeological finds, woodland and marsh nature reserve, and is being celebrated with a range of partners, including environmental organisations, local communities, businesses and schools. The event itself will be the culmination of a three month long programme of creative arts workshops, railway themed oral history gathering and expert led site visits, prior to the event. Children and community members have created temporary installations, performance, Interpretation boards and participatory fun activities along the way. On May Day Bank Holiday everyone is welcome to join us along the trail which you can walk, cycle or ride – at your own pace. You can join at the Sandown end, Newchurch or halfway along at Alverstone. There are refreshments and toilets at each stop. All Along the Riverbank is organised by the New Carnival Company with a range of partners within the East Wight Landscape project called Down to the Coast. Click here for the site map of the 2019 festival to give you a flavour of what to expect.